In 10 days, the final round of the French Presidential election will take place between Emmanuel Macron and Marine Le Pen. Now the markets are clearly betting on a Macron win. You might be wondering why the political developments in France should even matter to your portfolio, and the answer is simple: volatility. In a nutshell, volatility reflects uncertainty in the markets about the change in value of a security (stocks, bonds, commodities, ETFs) and how fast or slow that change is taking place. When volatility is higher, it means the price of the security can move higher or lower pretty dramatically over a relatively short amount of time. On the flipside, when volatility is lower, it means the price of the security will remain pretty steady over a longer period of time, and any changes in price will be relatively small. All the news surrounding the French election has already been affecting market volatility. For example, The Goldman Sachs Group (GS), Citigroup (C), and Bank of America Corp (BAC) as well as other banks jumped higher after the preliminary second-round results came in last Sunday. We’re also in the middle of second-quarter earnings season, with roughly 70% to 80% of S&P 500 companies still due to report over the next two weeks. 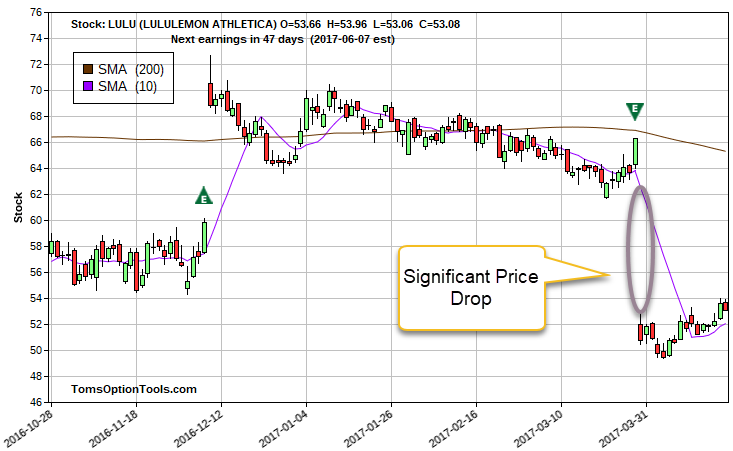 Earnings already causes volatility to increase, so when you combine a large batch of earnings announcements with the French election results, you’re looking at the potential for even more dramatic price moves within the next 10 days. 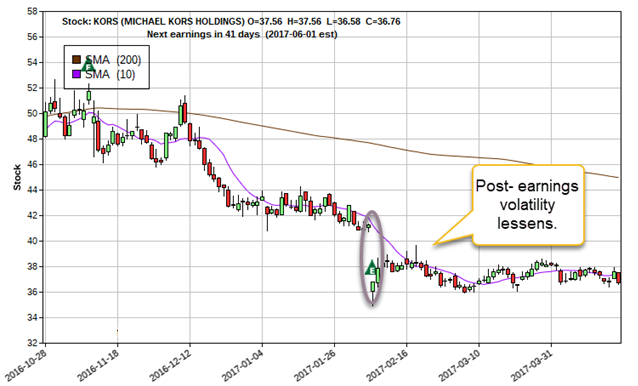 In both cases above, volatility increased going into and immediately after earnings. Typically, volatility decreases for a short time after earnings announcements, but nothing in retail has given me reason to change my mind about the continued challenge retail stocks will have going forward. Of course, there is one retailer that isn’t suffering: Amazon.com, Inc. (AMZN). 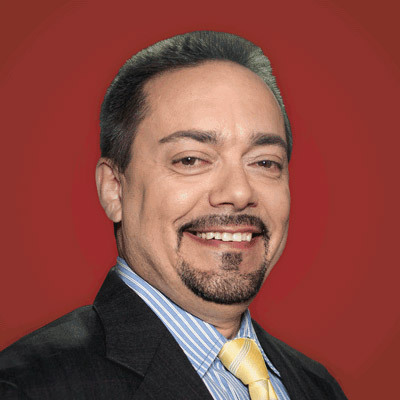 This should come as no surprise to you, as this guy’s pretty much a leading reason why the old brick and mortar store is dying out. Right now, the stock is trading near all-time highs, with earnings coming out at 4pm EST today. 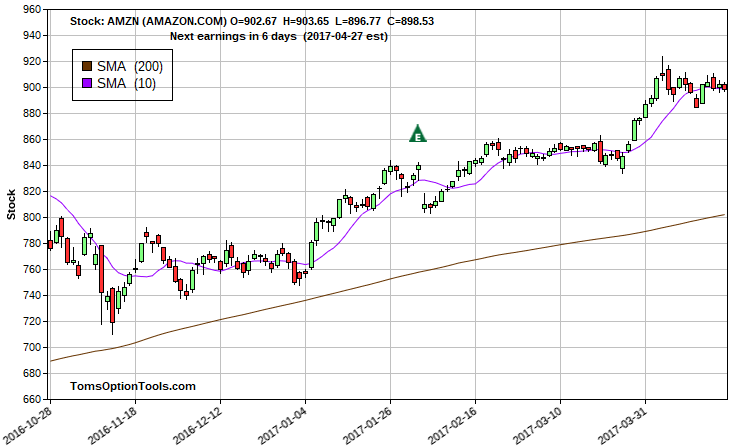 Now AMZN has climbed higher regardless of how good earnings are. However, the same can’t be said for many, many others. And the volatility we’re sure to see after the French election could only make things worse for these stocks – and your portfolio. And in a couple days, I’ll show you another major “event” coming that could help or hurt your portfolio just as much as the French election.